What is a storage array? It is a device or computer containing multiple hard drives that store large amounts of data (data mining), in Terabytes. Enterprises generally use them to store customer data, which assists them in keeping track of the progress of their businesses. The information can also be used to study the future of the company. This type of information, therefore, requires a large amount of space. Storage arrays are protected with security measures so that in the event of a hard drive failure, the data will not be lost. These devices are built to secure and keep information for when it needs to be accessed. Storage Capacity: Depending on if you are backing up personal information, or if your array will serve as a full-fledged business storage, you may or may not need huge storage capacity. With hard drives ranging from 2TB to 64TB, there are plenty of options, both for consumer and corporate levels. Speed: Especially when it comes to large files, it is worth considering the amount of time that will be spent backing up. Look into an array with a good hard drive transfer rate. Connectivity: Different storage arrays offer different connections to backup your information. From USB to Thunderbolt, to wireless communication, make sure you find an array that will connect in a preferred method and that will be compatible with your devices. Ease of use: While many individuals might prefer a device that has a more difficult configuration, but additional perks, some may seek an array that’s going to be more user-friendly and sync with little setup. Size: Lastly, the size of the storage array itself may need to be taken into consideration. If mobility is a requirement, smaller, more portable devices should be evaluated. If having a sedentary array is a non-issue, you may be able to go for the larger devices. Here the top 10 best storage arrays for 2018 and their reviews based off Amazon’s website. First on the list is this Noontec-Terra Master D4-310 external hard drive. It has a storage capacity of up to 40TB. goes up to 410MB/ seconds. With the D4-310, you can copy a 1GB video in just 2 or3 seconds. It is also compatible with Mac and Windows computers. The hard drive trays are removable and also easy to install. The D4-310 supports 4 SATA hard drives, but it is not included. With only 2 USB 3.0 high-speed hub ports, it can limit a number of hubs that users prefer. It can be used for personal storage to securely keep your family photos, videos and more. The drives can be configured in RAID 0, RAID 1, JBOD or Single Disk modes which allow customization to suit your personal needs for data security. This storage array device offers blazing performance and maximum storage capacity, with the flexibility to use a wide range of USB devices. 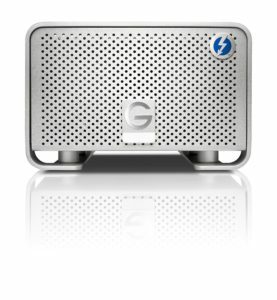 The #9 slot goes to the G-Technology G-Raid Dual Storage array device. It offers ultra-fast transfer speeds and high-performance with its Thunderbolt interface technology which makes it more than 12 times faster than Firewire 802. It uses RAID 0 configuration for maximum performance. The dual Thunderbolt ports facilitate simple to access and daisy-chaining for up to 6 Thunderbolt compatible peripheral devices. It is able to support multi-stream HDV, DVCPro HD, XDCAM HD, ProRes 422 and uncompressed SD workflows. It is not ideal for corporations and large businesses. This device is time machine-ready and only needs plug-and-play setup on Mac operating systems. It weighs 5.35 pounds and has a storage capacity of 8 terabytes. It may be used for personal storage requirements, a home office or other small business since it is a dual storage device. 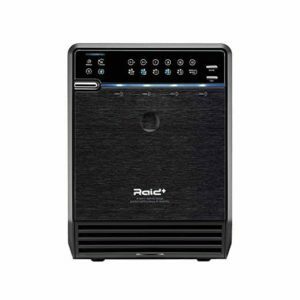 At #8 is the Mediasonic HFR2-SU3S2 which supports 3.5″ SATA I / II / III hard disk drive up to 10TB per drive. It also supports a hard drive transfer rate of up to SATA III Speed. The raid controller is a built-in board with a control button. The data transfer rate goes up to 5.0Gbps via USB 3.0 and up to 3.0Gbps via eSATA. This model has a smart fan with a built-in thermal sensor, for efficient cooling as well as automatic & manual modes with three 3 speed levels. It is compatible with Mac OSX 10.8 or later and Windows 10 / 8.1 / 8 / 7 so only updated devices may use it. It was primarily designed for small organization use, so big businesses would not benefit from it. This is another personal storage array device designed to meet the needs of home users and small businesses. 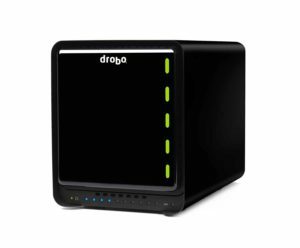 Making the list at #7, the Drobo 5D was designed to meet the needs of media creators and other professionals who demand large capacity data storage units. It uses the cutting-edge Thunderbolt 2 and USB 3.0 connectivity in addition to solid-state drive (SSD) acceleration, resulting in exceptional performance speeds. It offers automatic protection against hard drive failure. It operates very quietly and has a variable-speed cooling fan. This device can be configured to spin down non-used drives for noise reduction and energy saving, but it will reduce its performance level. if the interruption lasts longer than normal, the device could potentially lose its data. Whether you need to edit high-definition videos, store a large volume of photo files, or just backup your existing terabytes of data, the Drobo 5D can meet your needs for speed, expansion capacity, and security. If you are looking for secure storage for your home or office. 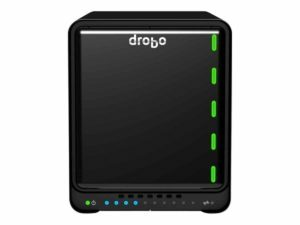 At the #6 slot is the Drobo 5N system which was built to accommodate up to 64 Terabytes of data. The connectivity is via GB Ethernet, with battery-backed memory similar to its 5D counterpart to provide protection in the event of power outages. It also has a built-in power supply. An optional mSATA SSD can be used to boost the performance of the 5N up to 10X (purchase separately). DroboPix, thus facilitating safe and secure automatic uploads of data. This device only runs in Raid 5/10 mode. It weighs 13.75 pounds because of the large capacity it has for storage, which can be bulky on a desk or holding area. This drive can be best utilized in large enterprises or where there is the demand for large volumes of storing data intensive files. 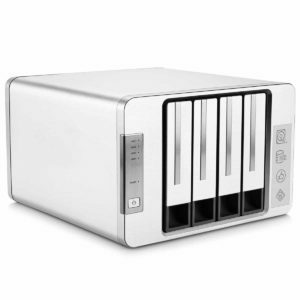 Sitting on the list at #5 is this Buffalo storage array 2 Terabyte single drive model. It is very lightweight at 2.43 pounds and does not take up a lot of desk space at all. It can easily be connected to a router to create centralized storage and backup for both PC and Mac computers. A free personal cloud can be setup with shared access to your content via the internet. Through the cloud, you can gain access to your data from any internet capable computer device. It has 1 USB 2.0 port with USB 3.0. This limits the use of more ports for some users. The set-up for different operating systems can be cumbersome depending on whether you are using a PC or a Mac. This device is the perfect lightweight storage array device for home use that does not take up a lot of space and still offers the flexibility of USB expansion, free personal cloud service, and scheduled backups. At #4, we have the Buffalo Linkstation 220 version which is a step up from the 210. 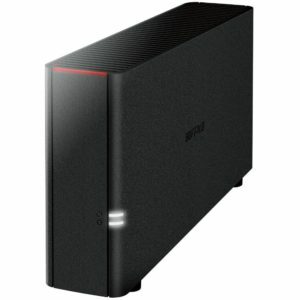 It offers the same 2TB storage capacity, however, it has the capacity to expand to up to 8 TB. As opposed to the 210, it has two drive bays instead of one. It has the same free personal cloud service, backup options for Mac and Windows PC, as well as alternative device setup. Videos and photos can be streamed to DLNA/UPnP connected devices. Designed for smaller organizations, big businesses would not benefit from using this type of performance in a device. It weighs 6.62 pounds and is about three times the size of the 210 to accommodate the expanded storage capacity. 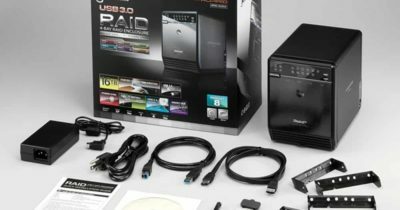 This expanded storage capacity Buffalo Linkstation 220 storage array device offers excellent storage options for the home, home office or small business. In the #3 spot is the dual-drive My Book Duo model. It offers up to 8 Terabytes (2 4TB hard drives) of personal cloud storage and weighs only 3 pounds. The user can select RAID 0/1 or JBOD to configure the drive for more speed (default setting: RAID 0), data protection (drive mirroring: RAID 1) OR operate as two independent drives (JBOD) mode. The data transfer speeds are lightning fast and can be protected through several backup options. It is not viable enough for a big business due to its lack of performance in what a big business needs for storage options. Speed and security with hardware encrypted RAID. This is another storage array system suitable for home use where you can choose the amount of bays to use based off needs. Again, the capacity makes it suitable for small business settings as well. 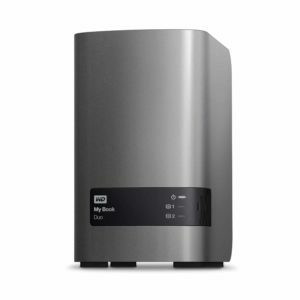 The runner up goes to the WD 12TB My Book Duo Desktop RAID External Hard Drive. 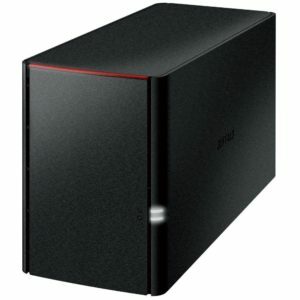 This model is an upgrade from the 8 TB model and has dual drive. It accommodates two 6TB hard drives. It also comes with free personal cloud storage and User-selectable RAID 0/1 or JBOD. This allows configuration of the hard drives for faster speed (default setting: RAID 0), data protection (drive mirroring: RAID 1) OR to operate as two independent drives (JBOD). 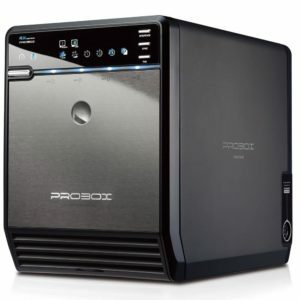 It offers the same high-capacity storage and backup capacity, super fast transfer speeds and a variety of options to backup and protects data. Although it does step up in performance to provide suitable options for the medium sized business, big businesses still need to find another option that best fits their needs. It weighs 3 pounds and USB connectivity. This device offers way more storage is more suitable for small to medium businesses. The winner is the Mediasonic ProBox HF2-SU3S2. This final storage array device is the most reviewed and best-rated product on Amazon. It supports all brands of 3.5″ SATA I / II / III hard disk drive up to 8 TB per drive and up to 4 x 8 Terabytes. It also supports SATA 3 and 6.0 Gigabytes per second is the hard drive transfer rate. The transfer rate goes up to 5.0 Gigabytes per second when using USB 3.0. It is compatible with Mac USB 3, has a Smart Fan function and a Thermal Sensor built-in. Automatic and manual mode, as well as one button interface selection, allows switching between the USB 3.0 and eSATA Interface. Depending on the needs of the user, the maximum capacity of 32 TB, although a lot, may still be limited for some. It is not compatible with Windows operating systems. This large storage capacity array device is well suited for medium to large businesses or enterprises. A 64 TB version of this would also be very useful for large businesses. The fast transfer speed and security are very impressive for this model. Terms and devices of technology can be intimidating for those who are unfamiliar with that field. However, this list provides consumers an easier way to find the best storage array device that fits their needs for either the home or business. Depending on speed, storage capacity or performance, there is an external hard drive device that will work for you.